Farmers are known to be living in the area of present day Ghana were farmers by the 5th century BC, and by the 9th century AD the then Ghana Empire was a major power, and included parts of modern Senegal, Mauritania and Mali. After the 10th century, the empire came under Almovarid rule, and was later incorporated into Sahelian empires such as the Mali Empire. From the 16th century much of the area was brought under the governance of the Ashanti Empire. Many European powers contested the area for trading rights from the 15th century, and modern-day Ghana fell under British colonial rule from the late 19th century. After Ghana gained independence in 1957, the country saw a series of alternating military and civilian governments, and was often affected by economic instability. Since 1992, when multi-party system politics was restored, Ghana has enjoyed relative political stability, and has seen growing economic prosperity. Ghana is a middle income country, with services accounting for around half of GDP, followed by manufacturing, extractive industries (including oil, discovered offshore in 2007; and gold, diamonds and a wide range of precious and industrial minerals). Agriculture is also important, particularly cocoa, of which Ghana is one of the world’s largest producers. Ghana has major surface water resources in Lake Volta and its tributary rivers, but away from these groundwater is a key resource, particularly in dry seasons and in the drier north. Overall some 40% of households depend on groundwater, and this rises to 60% in rural areas. In the drier north, urban areas also depend primarily on groundwater. Rural areas, particularly in the north of the country, still lag behind in water supply infrastructure. Please cite this page as: Obuobie, Agyekum, Appiah-Adjei, Upton, Ó Dochartaigh and Bellwood-Howard, 2018. Ghana's land area extends from the Atlantic Ocean (Gulf of Guinea) in the south, to its border with Burkina Faso in the north. In the west of the country a forest belt extends northward from the coast for over 300 km. The area to the north of the forest belt is largely flat or gently undulating savannah. The highest point is Mount Afadjato, which sits at an elevation of 880m in the eastern part of the country. The majority of Ghana is classified as a tropical savannah climate, apart from the south western corner which is designated tropical monsoon. Average annual precipitation is higher in the tropical monsoon region and generally decreases from south to north across the tropical savannah region. Average temperatures are slightly lower in the southwest of Ghana and increase towards the north. Precipitation varies throughout the year and is generally higher between April and October. In the south of the country this is more distinctly split into two wet seasons during April-June and September-October. Temperatures are generally highest in March and lowest in August. More information on average rainfall and temperature for each climate zone in Ghana can be found on the Ghana Climate Page. The most significant surface water feature in Ghana is Lake Volta, which extends roughly north-south over a distance of around 500 km. The Black Volta and White Volta Rivers flow perennially into the northern end of Lake Volta. The White Volta originates to the north in Burkina Faso. The Black Volta also originates in Burkina Faso but flows along the border with Cote d’Ivoire to the west before turning and flowing into the lake. Lake Volta is drained to the south by the perennial Volta River, which discharges into the Gulf of Guinea in the east of Ghana. Several other perennial rivers discharge into the Gulf of Guinea, draining the forest belt in the west of Ghana. The two main rivers are the Tano, in the west, and Ankobra, in the east. The Hydrological Services Department (HSD) of the Ministry of Water Resources, Works and Housing is responsible for all river flow gauging in Ghana, and all river gauging data are stored at the HSD. Generally, daily data exists from the 1960s onwards, but some stations also have data from before 1960. Some river flow data have been collected by research organisations working on individual projects. The German funded GLOWA Volta project, which ended in 2012, collected some river flow data that are currently held with the Volta Basin Authority (VBA) in Ouagadougou, Burkina Faso. The VBA has also been collecting river flow data through the VBA observatory, in collaboration with the Volta Basin riparian countries. Presently, the German funded West Africa Science Service Centre on Climate Change and Adapted Land Use (WASCAL) is recording river flow measurements at some locations in the Volta Basin, and has installed a number of automatic water level /discharge readers at selected points on the White Volta River and its major tributaries. The data are held by WASCAL at its offices in Ghana and Burkina Faso. The southwest of Ghana is dominated by Alisols. These highly acidic soils are typical of hot and wet climates and often form due to the weathering of minerals with a high aluminium content. 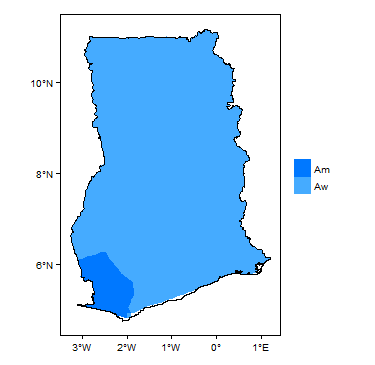 This area corresponds with the dense forest belt in southwest Ghana. In the north and east, the dominant soil types are Lixisols and Plinthosols. Lixosols are generally clay-rich, while Plinthosols contain high levels of iron. These soils often occur on plateaus or plains and reflect the weathering of predominantly basic rocks. Fluvisols are found along the valleys of the Black and White Volta Rivers, while Acrisols and Gleysols are more common in the eastern coastal region. 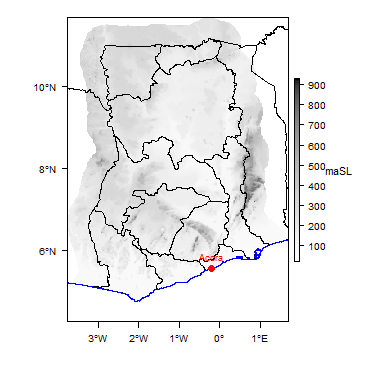 The mountainous area along the eastern border with Togo is denoted by Leptosols – these are generally very shallow soils that commonly form over hard rock. Source and more statistics at: FAO Aquastat. This section provides a summary of the geology of Ghana. More detail can be found in the references listed at the bottom of this page. Many of these references can be accessed through the Africa Groundwater Literature Archive. Other, larger scale, geological maps are available in printed format: see the Key Geology References section below for more details. 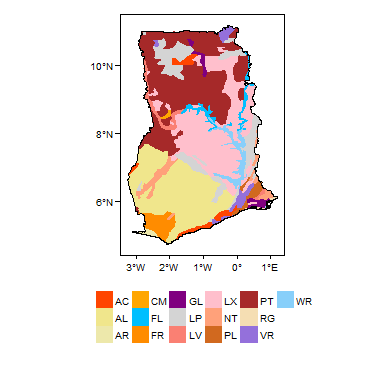 A regional project to update the geology map for the Volta and Keta basins, an area of approximately 100,000 km², included the production of a series of 48 new geological maps covering the area (Carney et al. 2010, Kalsbeek 2008). Isolated and spatially restricted coastal sedimentary basin geological units of Ordovician to Tertiary age, comprising the Keta, Accraian, Ammissian, Sekondian and Appollonian formations. These rocks are overlain in valley areas by generally minor alluvium and other unconsolidated deposits of Quaternary age. The following section provides a summary of the geology of Ghana based on these lithostratigraphic divisions. Sub-divisions of the major lithostratigraphic units are shown in the table below, although they are not distinguished on the map on this page. Tano Basin Quaternary Alluvium along river valleys. Keta Basin Series Sand, gravel, siltstone, shale and clays with layers of fossiliferous limestone. Found in the extreme southeast of Ghana. Amissian Formation Pliocene (Tertiary) to Recent Interbedded soft pebbly grits, conglomerate, micaceous sandstone, arkose, shales and clays. Apollonian Formation Cretaceous to Eocene (Tertiary) Marine sedimentary sandstones, clays and occasionally fossiliferous limestones. Found in the extreme southwest of Ghana. Sekondian Series Devonian to Cretaceous Dominantly sandstones and shales with conglomerates, pebble beds, grits and mudstones resting with major unconformity on a Precambrian complex of granites, gneisses and schists. Six formations are recognised in this series, with some being fossiliferous, others not. Accraian Series Devonian Alternating shales and thin-bedded micaceous sandstone, overlain by massive cross-bedded sandstone, and a thick sequence of sometimes fossiliferous shale and mudstone. Dahomeyan, Togo and Buem Formations Proterozoic (Eburnean) Mainly metamorphic rocks. The older Dahomeyan Formation comprises mafic gneiss, quartzite and mica schist. The Togo Formation comprises metamorphosed and folded sedimentary strata, including phyllite, quartzite and schist. The Buem Formation comprises a thick sequence of sandstone, shale and volcanic rocks. Birimian Group , granitoids and basic intrusive rocks Palaeoproterozoic Metamorphosed sedimentary rocks (schist, quartzite, slate and phyllite) alternating with five parallel, generally evenly-spaced volcanic belts. The sequence is intruded by various igneous rocks including granite (porphyritic, sodic-rich hornblende biotite granite and potassium-rich muscovite granite), gabbro, dolerite and diabase. Generally NE-SW trending, well fractured and isoclinally folded. This section provides a summary of the hydrogeology of the main aquifers in Ghana, on the lithostratigraphic divisions described in the Geology section. The hydrogeology of some of the sub-divisions of the major units is summarised, although the units are not distinguished on the map on this page. More information is available in the references listed at the bottom of this page. Other hydrogeological maps at different scales and in different formats have been produced; some are listed in the key hydrogeology references section below. Upper Voltaian: Obosum Group Very low to zero intergranular permeability. Sandstone units can show variable development of joints, open planes and faults, creating secondary permeability. In thick sandstone units where secondary fracture permeability is well developed, high yielding boreholes have been developed, but in other areas, sandstones have proved to have low productivity. Mudstone and siltstone areas generally form a very low productivity aquifer, with little groundwater. Groundwater from sandstones is often less mineralised than groundwater from mudstone and siltstones. However, there is some evidence that fluoride is more common in sandstones than in mudstones or siltstones. Groundwater from units dominated by mudstones and siltstones often has relatively high conductivity. Middle Voltaian: Oti/Pendjari Group Very low to zero intergranular permeability. Sandstone units show variably well-developed joints, open planes and faults, creating secondary permeability. Extensively fractured sandstone units can form moderately to highly productive aquifers, but there is wide variability in recorded yields, indicating that fractures are not well developed everywhere. Borehole yields range from less than 5 to 1000 l/min, but are often between 10 and 300 l/min. Units dominated by siltstones and mudstones tend to show lower yields, often between 20 and 40 l/min. Groundwater from sandstones is often less mineralised than groundwater from mudstone and siltstones. However, there is some evidence that fluoride is more common in sandstones than in mudstones or siltstones. Lower Voltaian: Kwahu/Boumbaka groups Very low to zero intergranular permeability. Sandstone units such as the Anyaboni Sandstone and Panaboko Sandstone formations often form moderately to highly productive aquifers, dominated by secondary fracture permeability, often in thin zones, with borehole yields often between 150 and 250 l/min. There is evidence for groundwater inflows to boreholes to at least 100m depth. Minor occurrences of saline groundwater have been noted in isolated boreholes, typically related to high sulphate concentrations. High iron is common, and high manganese in some areas. High fluoride concentrations occur rarely. Birimian, Granite, Dahomeyan, Togo and Buem Aquifers The primary intergranular permeability of the basement rocks in Ghana is generally low. However, they form aquifers where secondary permeability is increased: where there is a significant weathered or regolith zone, and in highly fractured zones. The characteristics of the aquifers are very variable as a result of the varying intensity of weathering and the anisotropic nature of fractures. The most productive zone of these aquifers is usually the lower part of the regolith and upper part of the bedrock, otherwise known as the sapprock. Yields from the basement aquifers are highly variable. Reported yields are from <0.1 to 10 l/s. Measured transmissivity varies between 0.2 and 119 m²/day. Storage is typically around 10-3. The basement aquifers are generally confined and vary in thickness from 2-20 m, depending on the thickness of the weathered zone. Borehole depths vary between 40-200 m, depending on the type of aquifer. Water quality in the basement aquifers is fair to good. Groundwater is typically slightly acidic (pH<6.5) with low salinity and total hardness, but slightly higher salinity occurs in some areas. High fluoride (up to 4 mg/l) occurs in some areas in the Upper Regions, as does iodine deficiency. High arsenic (>0.01 mg/l) has been seen in some parts of southwest Ghana, linked to the abundance of arsenic-bearing minerals associated with gold in mineralised veins. Recharge occurs mainly from rainfall. Few direct studies have been done on groundwater recharge in Ghana: those that have been done are largely for areas in the northern half of the country, using various methods including water balance, chloride mass balance, water table fluctuation and hydrological modelling. Groundwater hydrographs from more than 15 monitored wells in the northeast of the country suggest that the groundwater system in the country is active and it is affected by significant recharge and discharge. Recharge to all the aquifer systems in Ghana is thought to be mainly by direct infiltration of precipitation through fractured and fault zones along the highland fronts, and also through the sandy portions of weathered zones. Some recharge also occurs indirectly as seepage from ephemeral stream channels and pools of accumulated runoff in the rainy seasons. Though there is some inflow contribution from regional (transboundary) aquifers in West Africa, the main source of recharge to the aquifers in Ghana, particularly in the north of the country, is precipitation. 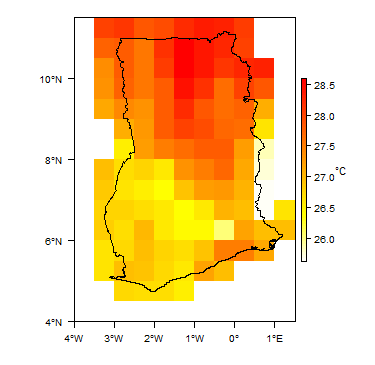 Estimated recharge values are generally low, varying from 1.5% to 19% of annual rainfall (Obuobie and Barry 2012), and there is high spatial and temporal variability. high levels of mineralisation, with total dissolved solids (TDS) in the range of 2000 up to more than 14,000 mg/l in some coastal aquifers, largely due to high salt (sodium chloride) from sea water intrusion (Kortatsi 1994). Many of these groundwater quality problems are natural in origin. A key process is geochemical weathering of the bedrock under particular hydrogeological and hydrochemical conditions, which can lead to high fluoride, iron and manganese, among other elements. Local hydrogeological conditions can also cause naturally low pH levels. Others are caused or worsened by human activity. Sea water intrusion is often related to over-abstraction of groundwater in coastal aquifers. There are also some isolated reports of high groundwater nitrate concentrations, thought to be linked to the increasing use of artificial fertiliser by farmers, although there may also be a link between increased nitrate concentrations and local contamination by human and/or animal waste. industrial use for the commercial production of bottled and sachet water. Over 95% of groundwater use in Ghana is for domestic water supply, mostly in rural areas and small towns (Gyau-Boakye et al. 2008). Overall, around 41% of households in Ghana depend on groundwater for their water supply (GSS-GLSS 5 2008) – this is generally much higher in rural areas (59%) than urban areas (16%). However, there are some urban areas, in the Upper East and Upper West regions, where 80% of the urban population depend on groundwater for their primary water supply. Less than 5% of groundwater in Ghana is used for irrigation and watering of livestock and poultry (Laube et al. 2008, MOFA 2004, Agodzo et al. 2003). Industrial use of groundwater in Ghana accounts for less than 1% of the total groundwater use. This includes large-scale commercial bottled water companies in the south of the country (Gyau-Boakye et al. 2008, Darko et al. 2003). There are no official national statistics of the numbers of each of these sources, but it is estimated that there are over 15,000 boreholes (hand pumps and electric pumps) and 45,000 hand dug wells across the country. In the Volta Basin alone, Martin and van de Giesen (2005) estimated that 29.4 million cubic meters of groundwater was abstracted in 2001 from 7,285 boreholes fitted with hand pumps, 36 piped groundwater systems, and 3,960 modern hand dug wells. The Water Directorate of the Ministry of Water Resources Works and Housing: this is the focal point for coordination of the water and water-related sanitation sector for policy harmonisation, sector-wide monitoring and evaluation of Ghana Poverty Reduction Strategy (GPRS) outcomes and Millennium Development Goal (MDG) targets, as well as coordination of foreign assistance (donor support/partnership) in the water sector. The Water Resources Commission (WRC): The WRC is mandated to regulate and manage the utilisation of water resources (both surface and groundwater) and to coordinate government policies in relation to them. The WRC also provides a focal point for fostering coordination and collaboration among the various actors in the water resources sector. The CSIR Water Research Institute (WRI): The WRI are responsible for conducting research into all aspects of water in Ghana, in order to provide scientific and technical information and services as well as strategies for the sustainable development, utilisation and management of such resources for the socio-economic advancement of the country. Community Water and Sanitation Agency (CWSA): The CWSA are responsible for facilitating the provision of safe drinking water and related sanitation services to rural communities and small towns in the country. Ghana Water Company Limited (GWCL): The GWCL are responsible for the provision of domestic water supply to cities and towns in the country. The Hydrological Services Department (HSD): This Department is under the auspices of the Ministry of Housing and Water Resources of Ghana. They are responsible for all river flow gauging stations in the country. There is not yet a separate legal framework for groundwater management in Ghana. The current legal framework is for both surface and groundwater. There is no longer private ownership of water resources in Ghana. The ownership of water resources, including groundwater, is vested in the president per section 12 of the Water Resources Commission Act (1996): “the property in and the control of all water resources is vested in the President, or anyone authorized by the President, on behalf of and in trust for the people of Ghana”. The Water Drilling Licence and Groundwater Development Regulations (LI 1827 of 2006) to regulate the development of groundwater resources. All drilling companies are required to obtain permits from the Water Resources Commission before drilling. However, there is no legal framework regarding how much water can be abstracted. The regulation of water disposal is a mandate of a separate entity, the Environmental Protection Agency (EPA). The EPA is represented on the WRC board and collaborates with the WRC in the issuance of waste disposal licences to avoid pollution of water resources. However, the collaboration is weak leading to conflicting situations in some cases. the Keta aquifer system, found in the extreme southeast of Ghana and shared among Ghana, Togo Benin, and Nigeria. It is a layered system covering an area of 2,721 square kilometres. Each country currently manages its share of the aquifer systems independently. Ghana recognises the need for agreements and cooperation between countries that share in its transboundary aquifers (e.g. Togo and Cote d’Ivoire). However, such co-operations and the necessary frameworks have yet to be initiated. Groundwater level monitoring in Ghana is managed at a national level. A limited number of monitoring wells have been established as part of previous groundwater projects implemented at river basin level. Between 2005 and 2012, a total of 70 monitoring wells were installed in Ghana in the Volta River, Tano, Ankobra and Densu river basins. These were funded by DANIDA, the European Union and CIDA. Ghana’s Water Resources Commission (WRC) mandated the CSIR Water Research Institute to undertake groundwater level monitoring. The collected data are currently stored in the WRC. Ghana also undertook a separate national groundwater monitoring project, in which monitoring is currently done by the Ghana Atomic Commission on behalf of the Water Resource Commission. There are no groundwater quality monitoring programmes. Many of the references below, and others relating to the hydrogeology of Ghana, can be found in the Africa Groundwater Literature Archive. Dickson KB and Benneh G. 1980. A new Geography of Ghana. Metricated Edition, Pearson Education Limited, Harlow, UK. Kalsbeek F (Ed). 2008. The Voltaian Basin, Ghana: Workshop and Excursion, March 10-17, 2009. Kesse GO. 1985. The Mineral and Rock Resources of Ghana. I–XIV, 1–610; Balkema, Rotterdam. Key RM. 1992. An introduction to the crystalline basement of Africa. In: The hydrogeology of crystalline basement aquifers in Africa, EP Wright, WG Burgess. Geological Society Special Publication 66: 29-57. The Geological Survey Department and Minerals Commissions are the key institutions in the country for acquisition of geological information. Hard copies of the two geological maps of Ghana referenced above can be obtained at a fee from the Geological Survey of Ghana. Agyekum WA and Dapaah-Siakwan S. 2008. The Occurrence of Groundwater in Northeastern Ghana. In: Adelana and MacDonald (eds), Applied Groundwater Studies in Africa: IAH Selected Papers on Hydrogeology 13. Barry B, Kortatsi B, Forkuor G, Gumma M, Namara RE, Rebelo LM, vandenBerg J and Laube W. 2010. 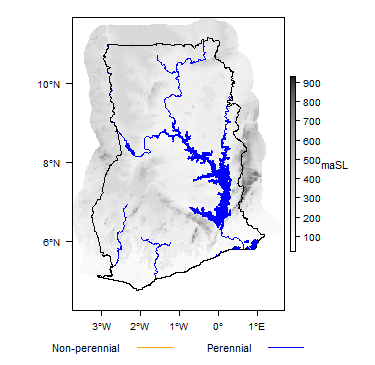 Shallow groundwater in the Atankwidi Catchment of the White Volta Basin: current status and future sustainability. International Water Management Institute. CSIR-Water Research Institute. 1996. Hydrogeological Map of Ghana on Regional Basis. Gyau-Boakye P and Dapaah-Siakwan S. 2000. Groundwater as Source of Rural Water Supply in Ghana, Journal of Applied Science and Technology, Vol. 5, Nos. 1 & 2, pp 77-86, 2000. Gyau-Boakye P, Kankam-Yeboah K, Darko PK, Dapaah-Siakwan S, and Duah AA. 2008. Groundwater as a Vital Resource for Rural Development: An Example from Ghana. In: Adelana and MacDonald (eds), Applied Groundwater Studies in Africa: IAH Selected Papers on Hydrogeology 13. Gumma MK and Pavelic P. 2013. 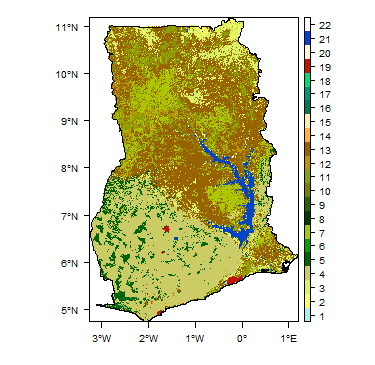 Mapping of groundwater potential zones across Ghana using remote sensing, geographic information systems, and spatial modelling. Environmental Monitoring and Assessment, 185(4), 3561-3579. 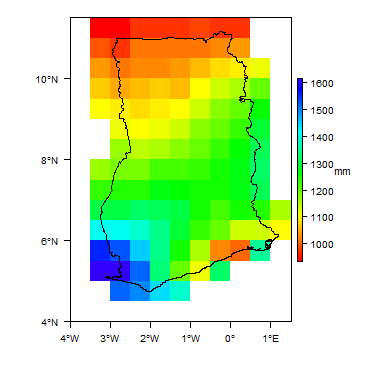 HAP (Hydrological Assessment Project of Northern Ghana). 2006. Hydrological assessment of the Northern Regions of Ghana: A bibliographical review of selected papers. CIDA, WRC, SNC-LAVALIN International. Martin N. 2006. Development of a water balance for the Atankwidi catchment, West Africa – a case study of groundwater recharge in a semi-arid climate. Cuvillier Verlag Gottingen, Ecology and Development Series, No. 41, 168 pp. Namara RE, Awuni JA, Barry B, Giordano M, Hope L, Owusu ES and Forkuor G. 2011. Smallholder shallow groundwater irrigation development in the upper east region of Ghana. Vol. 143. IWMI. Namara RE, Hope L, Sarpong EO, De Fraiture C and Owusu D. 2013. Adoption patterns and constraints pertaining to small-scale water lifting technologies in Ghana. Agricultural Water Management, 131, 194-203. Obuobie E and Barry B. 2010. Groundwater in sub-Saharan Africa: Implications for food security and livelihoods. Ghana Country Status on Groundwater. Final report. Ó Dochartaigh BÉ, Davies J, Beamish D and MacDonald AM. 2011. UNICEF IWASH Project, Northern Region, Ghana: An Adapted Training Manual for Groundwater Development. British Geological Survey Report OR/11/047. This page was last modified on 18 February 2019, at 17:17.